お知らせ ｜ 2019.04.11 2019年は亥年！京都の祇園に行くなら、建仁寺の「禅居庵/摩利支天堂」へ！/ The guardian boar! Have you already heard about the new name of era “Reiwa”? That is surprising that Heisei left only a month. 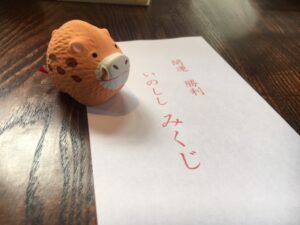 It is the year of Boar in 2019. The countries which use Chinese characters have “Sexagenary cycle”. There are twelve animal signs used as symbols for each year , like a Rat, Ox, Tiger, Rabbit , Dragon, Snake, Horse, Sheep, Monkey, Rooster ,Dog ,Pig. And it is called “Eto” in Japan. 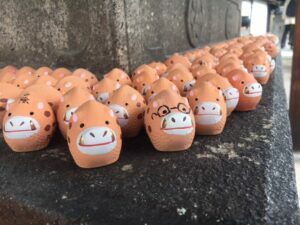 It is the year of Boar for 2019 in Japan. But that is Pig in China, Korean. 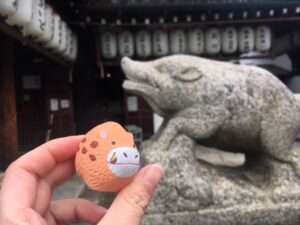 The reason why Japan named the year of Boar instead of Pig is there were no pigs in Japan at that time. It is said that Child who born in the year of Pig in China and Korean will have “economic fortune and happiness of life time”. That leads them into a baby boom. I was so shocked when I heard this story because no one in Japan would care about that. 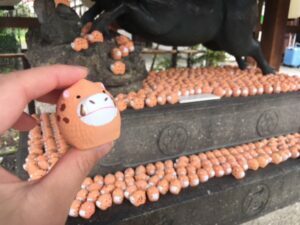 When you visit to Gion, Kyoto , I recommend you to go to “Zenkyo-an/Marishiten-do”! 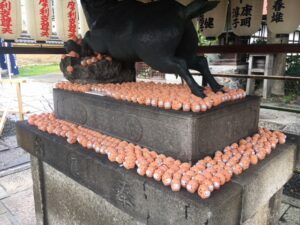 At Zenkyo-an, there are “Guardian boar” not “Dog”, how cute they are! The reason why they put guardian boar instead of dog is boars are followers of God “Marishiten”. It is like the relation of Fushimi Inari Shrine and Fox. Marishiten is worshiped as God leads to victory and lucky, many examinee and athletes come to pray for the God. There are mini boars around the guardian boar as photo spot. You can augurate boar fortune over there, fortune is written inside of boar made by ceramic. Actually you can enjoy this shrine by our Walking Tour! This is the blog about the tour.